Located just an hour northwest of San Blas Mexico you’ll find Santiago Ixcuintla Nayarit. When walking along the streets of Santiago Ixcuintla, which is the municipal seat of Nayarit West, you will be thrilled by the intense colors and essence of what it means to be Mexican. Enjoy a Mexico vacation in this area and you will surely find delight in this authentic Mexican town. Explore the archways of the main plaza, gaze upon the church, and marvel at the homes, many of which are considered important pieces of cultural heritage. Santiago Ixcuintla Nayarit is also known for its friendly people and abundant sense of culture and history, which is found around every corner. And, as testament to the history of this tranquil escape in the state of Riviera Nayarit the “Mural Nuestras Raíces” is a fascinating piece of artwork. This mosaic mural is 100 meters (328 feet) of intensely colorful tiles, which tell the story of our proud Mexican identity. South of Santiago Ixcuintla Nayarit are numerous beaches such as Los Corchos, Sesteo, and Boca de Camichín. 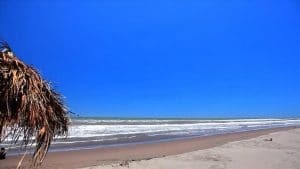 Come vacation in Santiago Ixcuintla and enjoy all the advantages of these almost completely virgin natural beach escapes. See our Riviera Nayarit Hotels page for nearby accommodations or check out all of our Riviera Nayarit destinations. Aiming to protect the natural wonders of the area, various ecotourism projects have been developed in order to give visitors to Santiago Ixcuintla Nayarit the opportunity to explore the area without negatively impacting the environment. For other things to do in the area check out our Nayarit activities and attractions page. You might also want to look at our seasonal Travel Deals page.